It's a bittersweet moment ... your baby is growing out of the crib. On one hand, isn't it great that you don't have to wake up several times a night for those nightly feeds anymore? But at the same time, you can't help but feel a pang of bittersweetness that your little one is growing up too fast. In any case, it's a milestone to celebrate! And it's time to get your little one a new toddler bed! There are many cribs that can be converted to a toddler bed, but if yours do not come with such versatility, don't worry we've got you covered! Our review below covers the best toddler bed of every type and design, you'll surely find the best one for your little one! 2. When Do You Need A Toddler Bed? If you've ever wondered how a toddler bed looks like, look no further - the Dream On Me Classic Toddler Bed is about as classic a toddler bed as you can find, and one that is superb in quality, too. Designed especially for toddlers as they transition from a crib to a bed, this toddler bed features two side safety rails and sits low to the floor - for ease in getting in and out of bed, for safety, and is reinforced for stability with a centre leg. Made of solid wood, this is among the best first beds for toddlers as it has been designed at preciously the right height your toddler can safely get in and out of bed. It is the perfect transition for toddlers who have outgrown their cribs, but are still too small for an adult bed. As such, it fits a standard crib mattress, one that you can move from the crib without needing to spend any money getting a new one. This classic toddler bed is available in 8 non-toxic finishes so you can choose one accordingly as bed for baby girl, or bed for kid boy. We like how all the edges are smoothly curved (rails, beams, arched head and footboards) so there is no sharp edges that can hurt your little one. Weighing in at just over 16lbs and constructed with solid wood, you can be assured that the Dream On Me Classic Toddler Bed is safe to accommodate your little one up to 50lbs before you need to make the switch to a full bed for toddler. And oh, it doesn't disappoint if you're looking for cheap kids beds (who isn't?) too! A car bed is probably the very first thing that comes to mind when someone mentions about toddler bed, and we can't blame you - it's one of the most popular design in terms of cool toddler beds for boys! And there's a good reason to it too - your little one will be so excited going to bed at night, there will be no trouble putting him to sleep anymore! 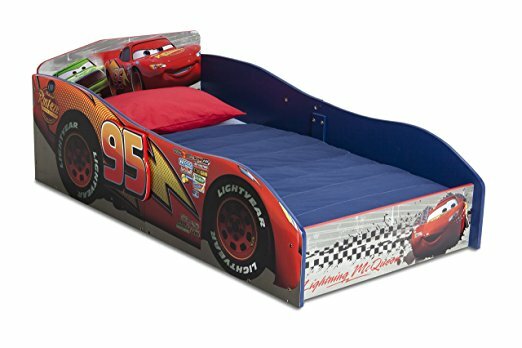 This one from Delta is designed in the popular Lightning McQueen car design that truly resembles a speed car, you can be sure your little boy will be racing to sleep each night. Made of strong and sturdy wooden frame, this toddler bed has its two sides built high up that serve as guardrails to keep your child safe. It helps train his independence during the transition period before moving to an adult bed with his safety assured. Rest assured that your little one is sleeping in a JPMA certified bed. In our opinion, the Delta Children Wood Toddler Bed is one of the best boys beds if you're after cool designs. And it's not limited to boys only, it comes in Frozen and Minnie Mouse designs too for those looking for toddler beds for girls. 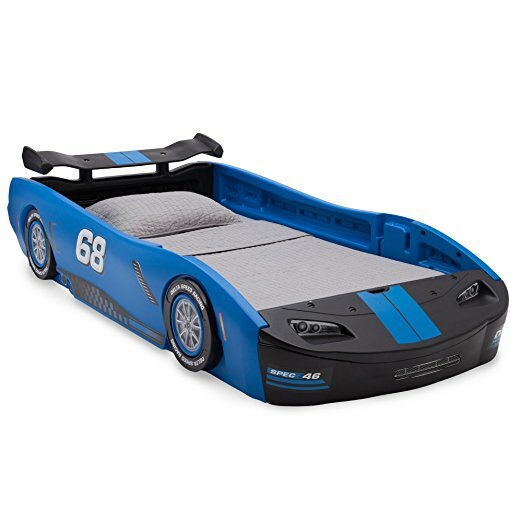 Now, if you don't want to spend money on a toddler bed that may only last till baby turns 6 or so, but still want your adult size bed to look fun and kid-like (you know, to tempt your little one to bed during those early years), then you should look for a twin bed like Delta's Children Turbo Race Car Twin Bed. It is among the best twin size beds for boys thanks to its realistic details as a classic race car. Made from durable, moulded plastic, it features a low twin bed frame for toddler to ensure his/her safety. The high sides of the race car act as secure guardrails and allow kids of all ages to easily enter and exit the bed. And who says race cars are meant for boys only? Delta makes girl car bed for toddlers too! The same bed comes in pink and is complete with realistic details like rear spoiler, a front grill and racing tires with chrome-colored rims. Because it is in full twin size, the Delta Children Turbo Race Car Twin Bed is recommended for kids of all ages. Do note that you have to buy the mattress separately, but considering it will last for years to come, this is among the best cute beds for kids that you can invest in the market! 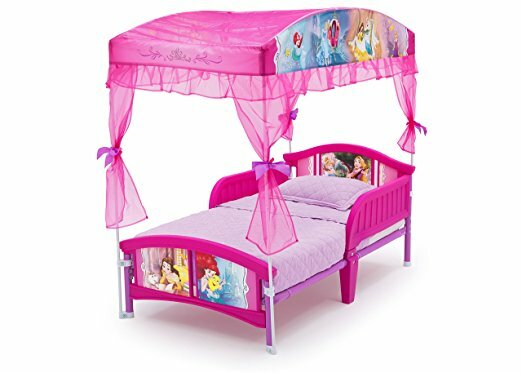 Enough with cars - what about those dreamy, princess-y twin size beds for girls? 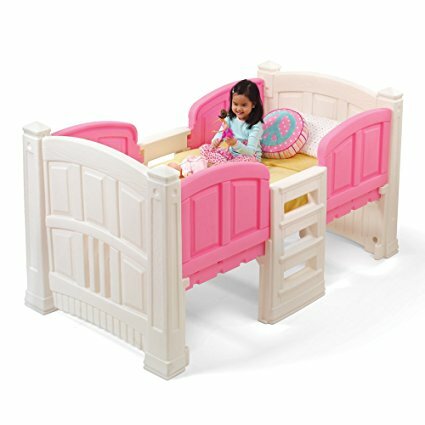 Look no further, the Step2 Princess Palace Twin Bed for Girls is the ultimate princess bed for your little girl. 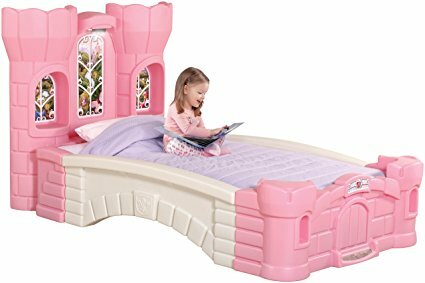 Complete with a headboard with twin towers features and 'windows' that come with a scenic view outside the castle, this princess bed will surely fulfil all your little girl's fairy tale dreams. And oh, it has built-in lights too to add to the dreamy effect! As with all twin beds for kids, this one also has a low bed frame for ease of getting in and out as well as protective wide side rails that can accommodate an adult to sit for story time. The 'window sills' are perfect for alarm clock, books and more. Do note that the Step2 Princess Palace Twin Bed for Girls is on the higher price point side and may not be for everyone. 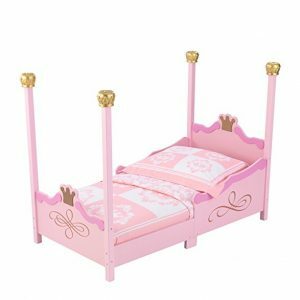 Don't worry, we have found another princess twin bed for toddler girl that is more budget-friendly here, or if you simply want a twin bed frame for toddler girl to fit over your existing bed, this one here is a good choice too! What about those who have limited space in their room? It doesn't mean you have to compromise on the size of your kid's bed, not with the Step2 Girl's Loft and Storage Twin Bed. 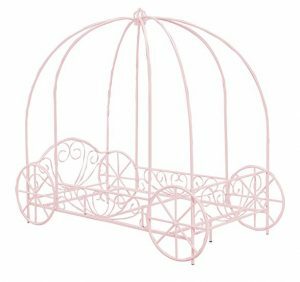 As you can tell from its name, this is a toddler bed for girl that comes with 28 cubic feet of storage space underneath. Now that's a lot of storage space if you'd ask us! Simply buy bins to stash away toys and whatnots and slide them underneath the loft bed and voila, you keep things neat and tidy in your nursery. If you worry about the loft being too high up and that your little one may roll over the center climbing ladder, don't be - both sides of the bed are secured with high rails for optimal security. Of course, you should wait until baby turns 36 months or more before transiting him/her into this loft bed. One thing that stands out most with the Step2 Girl's Loft and Storage Twin Bed is how easy it is to put together. It is perhaps the most raved feature, aside from its princess design. And for the boys out there, don't worry, Step2 has got them covered with a boy version too, check it out here! Kids beds for girls don't have to be castle-like only - the Delta Children Canopy Toddler Bed is another popular alternative amongst parents too. This is a standard toddler bed that fits most standard crib mattress, so you can make the transition from crib immediately without having to buy another separate mattress. If you're looking for cheap toddler beds with mattress, this one comes with it too with a slight addition of money. Otherwise, the standard packaging comes with a bed frame, canopy frame and canopy so everything is ready to go once you've assembled it. The Delta Children Canopy Toddler Bed is also one of the cheap children's beds you can find in the market. The only hard thing is to decide between the Disney Princesses, Frozen or Classic Minnie Mouse designs that the brand offers! 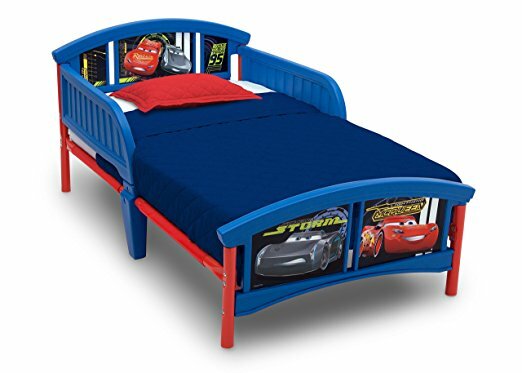 However, when it comes to cheap toddler beds, nothing beats the Delta Children Plastic Toddler Bed in Disney/Pixar Car design. Recommended for ages 15 months and beyond, this toddler bed is made of sturdy steel frame and high-quality plastic construction so you don't have to worry about it being flimsy or unstable. 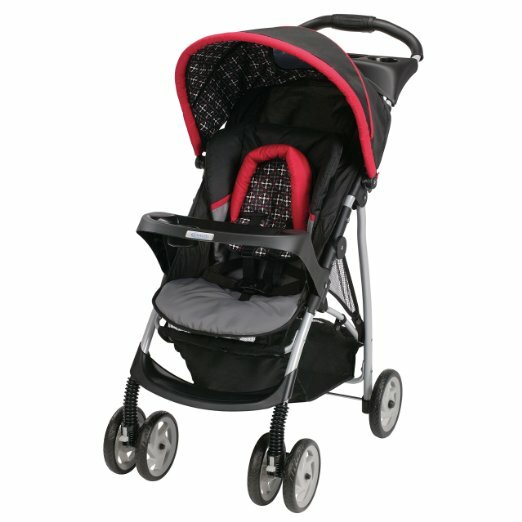 Do note that you should adhere to the weight limit of 50lbs though, as going beyond will put your child in danger. It comes with 29 colour design (different prices) so the choices are abundant with this one here. Just choose one that goes with your theme or child's liking and you're good to go. 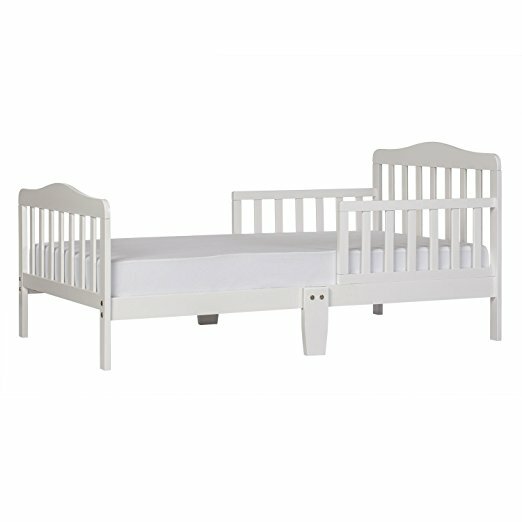 And with a price like this, you really cannot go wrong with the Delta Children Plastic Toddler Bed! So, you don't want to have to keep buying different beds each time your little one outgrown his/her old crib? 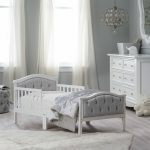 A convertible toddler crib is your answer and this one - the Elizabeth II Convertible Toddler Bed from Davinci is the best out of all. At toddler bed setting, the Elizabeth II fits a standard crib mattress so you can continue using your old crib mattress without having to buy a new one. The lower profile crib makes for easy reach and getting in and out and the side rails prevent your child from rolling out. Once s/he no longer fits the toddler bed, you can easily convert it into a full-sized bed as that shown below with a few railings (sold separately) and that's it, you don't need to go on a hunt for another adult bed. You can be sure it will definitely last a very long time because it's made of high quality 100% sustainable New zealand pine wood with a non-toxic, lead and phthalate safe finish that underwent multi-step painting process. You may think that with such high quality and versatility, the Davinci Elizabeth II Convertibe Toddler Bed may be too expensive. Trust us, you will be completely surprised when you find out about its price - this is definitely the best convertible toddler bed out of all that are available in the market. If you're looking for a toddler bed for two, the best choice is no double a bunk bed. Among all the bunk beds for kids available in the market, we think the Storkcraft Caribou Solid Hardwood Twin Bunk Bed is the best out of all - quality and price wise. 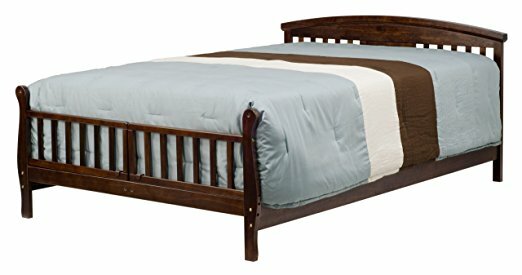 It's hard to find a bunk bed that is made of solid hardwood at such an affordable price these days. This one from Storkcraft is made of environmetally-friendly, high quality solid rubber wood that is far more superior as rubber wood is naturally much denser, sturdier and more durable than the commonly used pine wood. 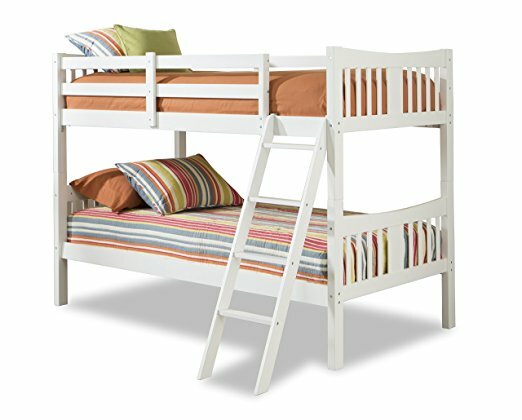 Best of all, this does not reflect in the price point as it is comparatively cheaper than most bunk beds in the market. It includes a sturdy four-step ladder and full-length guardrails with high-quality fastening systems to keep your little one safe at the top bunk. It also makes for the best kids beds if you decide to configure it into two separate twin beds, which is completely doable with its versatile design. 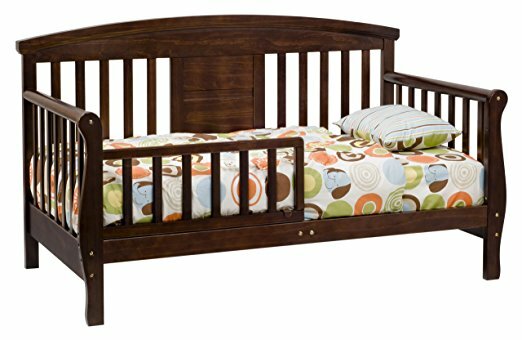 Overall, the Storkcraft Caribou Solid Hardwood Twin Bunk Bed is among the best cheap toddler beds that will last for years to come. 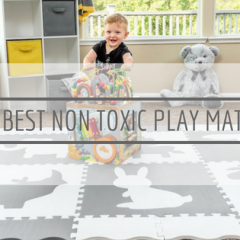 Compliant with all ASTM and CPSC safety standards, it is available in multiple non-toxic finishes which you can choose to either make it as bunk beds for girls, or toddler beds for boys. Now, which kid doesn't love a loft bed? Especially one that comes with a slide? 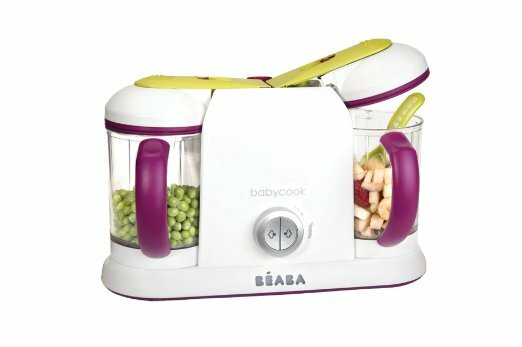 It's every toddler's dream come true! 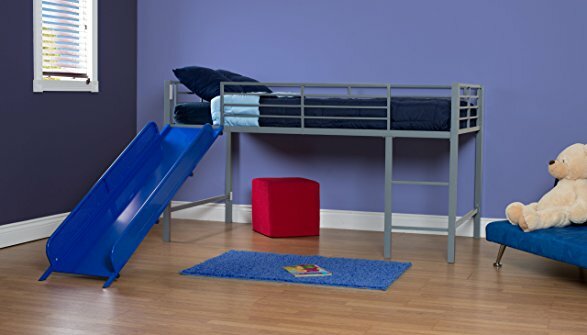 This Junior Twin Metal Loft Bed with Slide by DHP is among the brand's bestseller and it's not hard to see why - one of the most affordable loft beds for kids in the market that does not compromise on quality, its versatility is second to none. Why do we say so? There are many ways you can use this loft bed - just as it is as pictured above with the bottom left bare and open. Some parents utilise this space to organise their little one's clothes or toys in these cabinets so that things do not lie around messily. Perhaps the most popular use of this bottom space, though, is to turn it into a play space for your toddler. 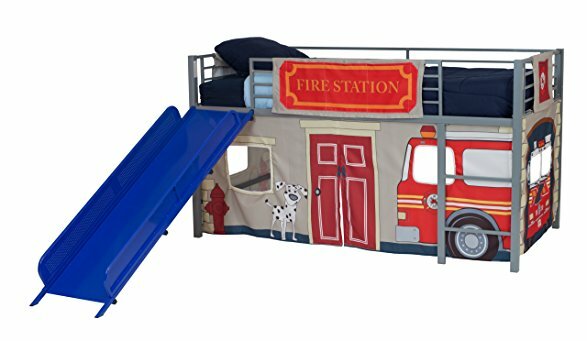 Simply purchase a custom curtain set to dress up the loft bed as a fort, bakery, fire station or even as a castle for the princesses and we guarantee this will be your little one's favourite hide out. You can dress it up however you want with the variety of curtain sets available and voila, you have a custom-made design for your little prince or princess at an affordable price. See what we mean by versatility? Functionality wise, this loft bed does not disappoint too. The rail pockets beside the bed are ideal for storing video games, books, kids' tablets, dolls and action figures. You will be glad to know that it accommodates one standard size twin mattress so you do not have to worry about buying another mattress again. In a way, you can say this is beyond a standard toddler bed as it measures bigger than the usual toddler beds. In any case, it is not suitable for children under 4 years of age, anyway, given the presence of a slide (note there is a weight limit of 200 pounds). This playful and decorative Junior Loft with Slide is hands down the best toddler loft bed that is fun and affordable. Moreover, it is easy to set up - everything you need is inside the box and you can finish assembling in minutes. You won't be disappointed! While toddlerhood technically starts at the age of 1, usually, many parents do not switch their baby out of the crib until 18 months old, some we know even waited until baby is 2 or 3 years of age! 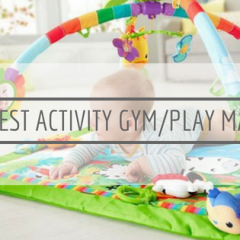 Have you caught your little one climbing out of the crib more than once? It is perhaps time to get a toddler bed to prevent him/her from falling over and hurting himself. Do you have a baby on the way? Often, this is the reason parents make the switch to toddler bed so that the crib can be ready when baby no 2 (or 3, or 4) arrives. You decide to put an end to co-sleeping - be it it's time to train your little one to be independent, or that his/her wake up time is a tad too early for you. It's a bittersweet moment ... your baby is growing out of the crib. In any case, it's a milestone to celebrate! And it's time to get your little one a new toddler bed! There are many cribs that can be converted to a toddler bed, but if yours do not come with such versatility, don't worry we've got you covered! Take advantage of the Black Friday and Cyber Monday Mega Sale and get yours now today! Davinci Elizabeth II Convertible Toddler Bed - MEGA SAVER ONLY THIS BLACK FRIDAY AND CYBER MONDAY!